Over the last year or so that I have been writing Gerry's Kitchen, I have been lucky enough to meet some fantastic local producers and sample the excellent food that they grow, breed or create. Most of the producers have quickly incorporated social media into their marketing and promotion, which in turn has helped me learn about other companies who are operating locally but just haven't crossed paths with me yet. 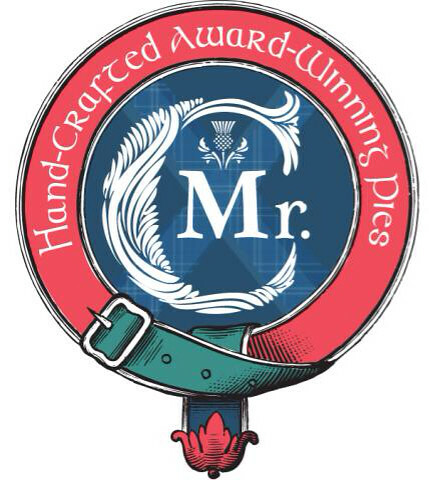 One of the names that I kept seeing being mentioned on Twitter was Acanthus Pies, now rebranded to Mr C's, a Fife based pie maker who make their own twist on the Melton Mowbray style pork pie. As well as making their own branded pies, they also produce pies for a number of meat producers across the country including my own local favourite - Lochbyre Rare Breed Meats. By all accounts, pieman Robert Corrigan is the 'Mr Kipling' of his genre, so this was a collaboration that I was keen to sample so after a few tweets to both Lochbyre and Mr C's, my pie was on order and ready for collection at the next farmers market. In 2006 I was privileged to be one of 30 “chefs” representing the UK at Terra Madre in Turin with Slow Food. While there, I listened to farmers complaining about chefs, hotels and restaurants using mainly prime cuts of meat and not using lesser cuts of great meat – In other words NOT using the whole animal. On my return I was looking for a new project in catering and decided to look at high quality hand-made pies , similar to those made under the Melton Mowbray name. I sought out who I considered to be the best makers and arranged to spend time with some of them to learn their techniques. I then returned to Glasgow and experimented with different flour combinations and water quantities – and market tested them on few hundred people , who gave me helpful feedback on the various pastries and fillings. In a very small very labour intensive way using only a wooden dolly and a domestic oven I set to work to get product recognition. This was now 2010. In 2011 I entered the British Pie Awards and to my great surprise won GOLD for a savoury Cold Cutting Pie. (The only GOLD awarded in the class) our PORK PANCETTA and LEEK. In 2012 I was in Egypt during the British Pie award and got a customer to bake my entries. Sitting in Cairo I saw on the internet my pies caught on camera and at least ¼ of each pie looked burnt!!!! To my astonishment I received a Bronze award for my Celebration Pork Pie and a Bronze for my Chicken and Ham pie. 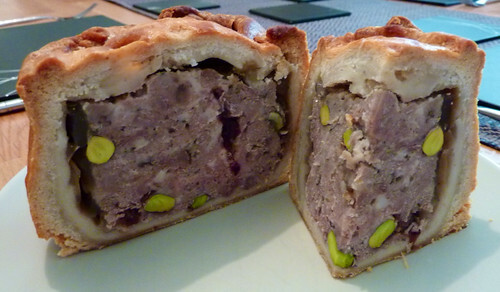 We also make for Peelham Farm a Traditional Pork Pie. Using their organic pork, in addition we make a Ruby Veal and Ham Pie with whole grain Mustard and a wonderful Mutton Ham with Capers pie. We also make pies using fancy French-style pie moulds: 1.75 Kilo and 1.85 Kilo Pies in all the six fillings for individual clients for shoots and family gatherings. We also made a special pie in September 2012 for the launch of Scotland’s Food and Drink Fortnight in Edinburgh – This was a Scottish Breakfast pie – Pork and smoked streaky bacon, with mushrooms and organic egg at its centre and we added tomato juice to our jelly to make a Breakfast in a Pie. So far, my fillings have come from tradition and a derivation of my Christmas stuffing recipe of some 20 years ago. Things haven't stopped for us and just after Christmas after Christmas, we went on to win Diamond 2013 at the Scottish Pie Club Awards, as well as lifting the Maclean Cup for 'Best Scottish Savoury' pie. 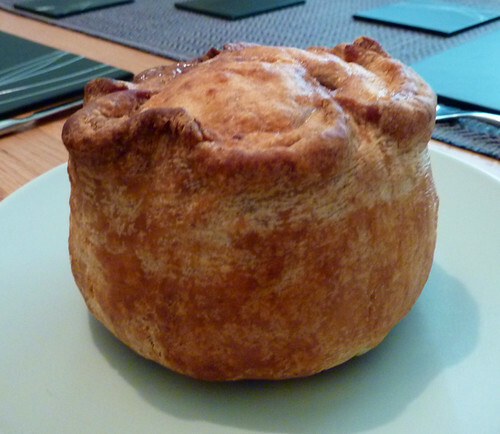 I’m considering more ideas for new pies in 2013 including a new chicken curry pie, as well as looking to work with a few producers to make pies using recipes customised just for them. We are also preparing to make one from a sausage mix used by Crombies. What's the best piece of business advise you can give? Always under promise whilst making sure to over deliver! To be an established business recognised for high quality with high standards, aiming to push annual turnover over the £500,000 mark. If you could have only one of your products, What would it be and why? Our Savoury Pork Pie - (Pork, Apple, Pistachio Nuts, Dried Cranberries, Sage and onion) it was our first biggest seller when I started. It is also a derivation of my Christmas stuffing for more than 27 years ago. My late Mother as she was a true inspiration and never tasted such wonderful pies. The menu would consist of simple classics accompanied with Vintage Bollinger throughout, starting with Inverawe Smoked Salmon & Brown Bread before moving onto a fish course of Grilled Halibut on a bed of spinach. We would follow this with a main course of Roast Aylesbury duck with Orange sauce, Creamed potatoes & seasonal vegetables. Providing that we still had room, a dessert of warm Apple Meringue Pie with fresh custard would be waiting on us. To finish off my last meal, we would relax with a pot of Assam tea and homemade shortbread. Absolute bliss! I've always enjoyed the concept of the pork pie but often find that the pastry on the shop bought pies can be very dry and tasteless, this was not the case with the speciality pie that we had sampled. The pastry on Mr C's pie was light and crisp yet slightly moist too. The filling of well seasoned Lochbyre pork with pistachios and cranberries was deliciously well seasoned and encased in lovely porky jelly. Initially I thought that pork pie could be served with the traditional Ploughman's Lunch although apparently the Ploughman's should consist of just cheese, bread and beer. Although upon further investigation, it would appear that the Ploughman's Lunch is actually the result of a cheese marketing campaign from the 1960's. 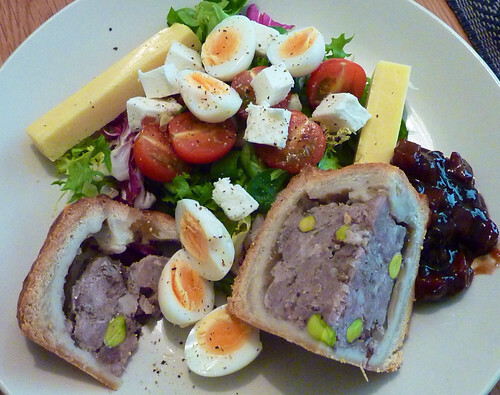 Regardless, our Mr C's speciality pie produced for Lochbyre Rare Breed Meats worked well with boiled quails eggs and my very own Blogger's Lunch. Myself and Nicola both enjoyed Mr C's pork pie and look forward to trying more of the other flavours, with the Piggy Black top of my list. You can keep up with Mr C's on Twitter. The website is currently a work in progress and I will update as soon as it is available.